Aemilia Ars Needle Lace - New Book! Nothing lifts the spirits bogged down by winter doldrums like a new needlework book! Pictured above is the third and latest publication in the Quaderni di Aemilia Ars series. 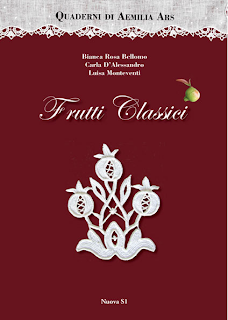 This time the ladies of the Associazione Culturale "I Merletti di Antonilla Cantelli" tackle fruit! Classic Fruits is the title and in addition to pomegranates and grapes there are acorns, sheafs of grain and all the appropriate foliage to help you create nine exquisite projects of various sizes and difficulty. 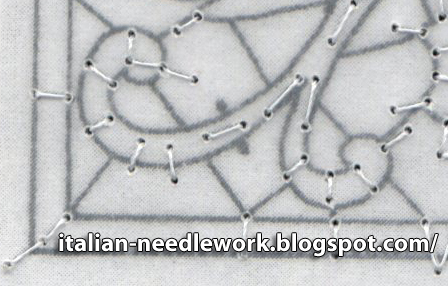 There are detailed instructions with the support stitches visible and though the text is only in Italian, if you've been experimenting already, you should be able to follow along. 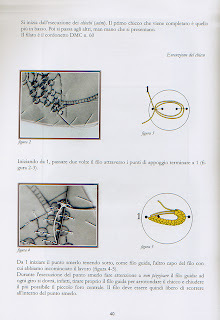 If this is your first foray into Aemilia Ars Needle Lace, there are diagrams and close-up fotos to help you figure things out if you don't speak Italian. Sample page. Copyright Nuova S1. This soft-cover book is a healthy 80 pages made up mostly of close-up photos, something I really like! I really want to be able to count the stitches in an example when I'm doubting whether I've done something correctly. I never have any idea of how many stitches should be filling an area and I'm always afraid to make my own guess, so this really helps me become a little more comfortable when learning something new. The acorn, pomegranate, grapes and sheafs of grain are recurring motifs in our lace. Not all are fruits in the true meaning of the word, but we believe in the understanding of the reader for this and other inaccuracies. We have indicated these fruits as classics for their presence in many contexts (traditions, history, legends, sacred texts, designs, heraldry) and their various symbolic meanings more often changing over time and from place to place, they themselves have changed. Among the many possible executions of each motif, in the technique Aemilia Ars, we have made a particular choice, dictated primarily by simplicity. The pictures indicate the orientation of the piece during execution. The drawings were done in pencil. We are not interfering with the result: we wanted to maintain that undeniable charm that the lines have – a bit faded and certainly always irregular. Everything is now in the hands of those who will make and give their own interpretation. If you've already seen the two previous books in this series: Fiori [Flowers] and Bordi [Borders], then you know that this will be a rare and valuable addition to your library. If you're in Europe, you can order directly from the publisher, Nuova S1 and pay by bank transfer. If you are overseas, you can pay with PayPal from Tombolo Disegni (send an email request to order). Look for the May/June 2013 issue of Piecework for another great project in Aemilia Ars Needle Lace! 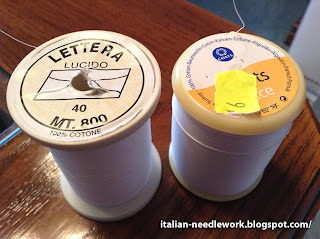 Many times when we are interested in learning a new needlework technique, we go about gathering the "right" supplies. I know for me, when I want to start something, I get a lot of the enjoyment from the hunt for materials. I have only dabbled in Aemilia Ars needle lace, a quick 3-hour class back in 2007 and some experiments on my own at home. Nothing I want to show anyone! 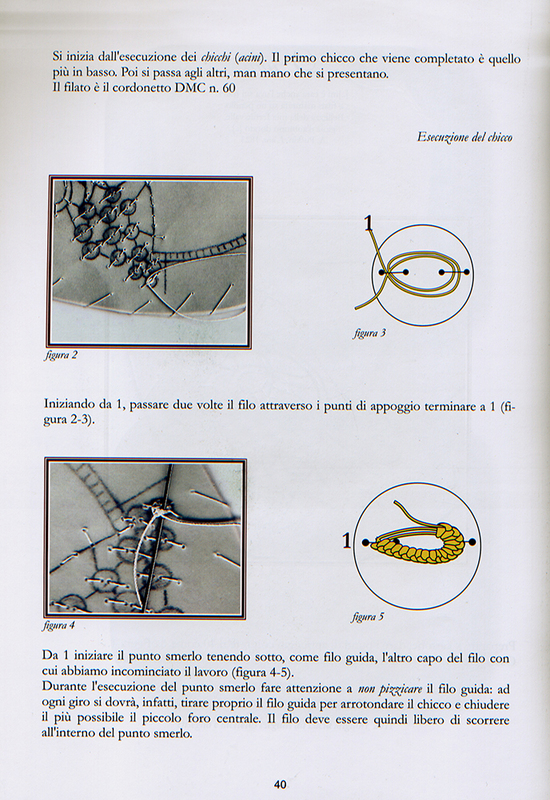 From reading Italian books on how to execute this beautiful form of needle lace, I saw that they used something called "Refe" no. 40 for the support stitches. That is, the stitches which are placed on the cardboard support to hook on to when building a piece of lace. I have never been successful in obtaining a spool of this mysterious "Refe" no. 40 so I've always just used cotton sewing machine thread. It is quite annoying as the sharp needle used to execute the actual lace always pierces the support stitches making it quite the task to separate the lace from the cardstock support. There are always endless little fibres from the support stitches to be extracted from the lace. 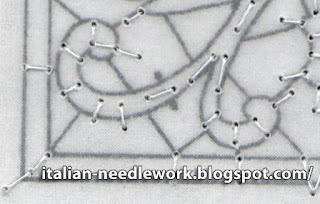 Here is what I mean by support stitches, I can't show you the whole design as it is about to be published in the May/June Lace Issue of Piecework. I learned that the "Refe" no. 40 is not terribly easy to find in Italy either as it has been discontinued. The ladies are now using a new thread called Coats Glace no. 40. I immediately set about finding myself a spool (in the interests of research, you understand). I couldn't find it anywhere around here (North America) so I wrote to the Coats UK website asking where I might get some locally. While we wait on their reply, you can see what it looks like and read about its particular qualities at the Coats UK website. Keep in mind, we are talking about the Ticket no. 40 thread weight. Meanwhile, I found Coats Glace for sale at TomboloDisegni in Italy (look under: Negozio, Filati, Cotone, Filati Vari), so I ordered a spool (among other things) and when it arrived I used it for the support stitches in the photo shown above. I always test my translations to see if my English makes any sense, so after I had translated the instructions for this piece, I started to see if I could execute the lace. What I noticed right away was that I no longer split the support stitches with my needle when executing the lace stitches. Fantastic! If I ever finish the lace, it will be easily removed from the cardstock and support stitches. Conclusion: the Coats Glace no. 40 thread is worth the investment as it will save lots of time and frustration in the long run. Now, because I am who I am, I still wanted to see the "Refe" no. 40 thread and some kind ladies in Bologna send me a partial spool of it. The first thing I noticed is that the label doesn't have "Refe" on it anywhere! No wonder I couldn't ever source a place online to buy it! No matter! It was called "Lettera Lucido" and put out by Coats Cucirini which is the Italian division of Coats. Comparing the two threads, the Glace is ever-so-slightly thicker and has 100 metres more thread on the spool but otherwise has the same stiffness to it, which is because of the way it is made. I can't get the price tag off the Glace thread without removing the paper below so I've left it there so you can see through it (underneath it says: Coats Glace, made in Turkey). If I ever hear back from Coats about a North American source, I'll let you know! UPDATE: a second exhibition has been announced at the Palazzo Davanzati. The Club del Punto in Croce is organizing an International Textile Art Exhibition called "The Chatelaine de Vergy" to be held at the Palazzo Borghese, at No. 110 Via Ghibellina in Florence November 9 - 30th, 2013. 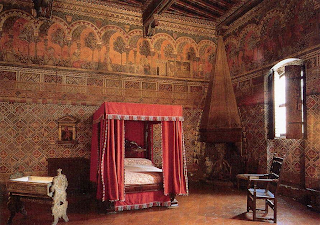 The theme of this exhibition is the story of The Chatelaine de Vergy, a 13th century French chivalric romance which inspired the frescos done in one of the bedrooms of the Palazzo Davanzati (picture above), which is a different palazzo in Florence. Palazzo Borghese in Florence. Image from Wikipedia. For reasons of space availability and hours of operation, the exhibition will be held at the Palazzo Borghese in Via Ghibellina which lies 600 metres away from the Palazzo Davanzati. You can read an English version of this tale by downloading a free pdf file here. The original tale was written in French and translated into Italian and if you search for images with the terms: "La Castellana di Vergy" you can see some of the frescos from the Palazzo Davanzati. The exhibition will be comprised of the textile works of all those who wish to enter a piece of work inspired by the frescos and/or furnishings of the Palazzo Davanzati. 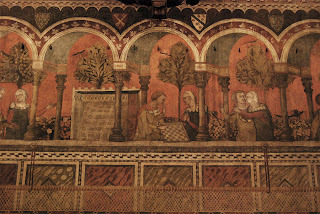 Art, history, cultural research and dexterity are the ingredients of this exhibition and the Club del Punto in Croce hopes this will bring about fascinating creations of embroidery, lace, macramé, quilting and other textile arts to be admired by multitudes of enthusiasts and others who are interested in the ancient handicraft techniques for which Florence has been particularly known worldwide for centuries. Open to all techniques related to the needle and thread, used alone or in mixed media. All forms of all kinds are accepted with dimensions not to exceed 150 cm x 100 cm. For quilted works, you will need to construct a support system so the back may be seen (pocket, pole, hook or other) to aid in the exhibition which must be sent along with the work. For the purposes of setup, each participant is required to submit the dimensions (which can be approximate) of their finished work by the 31st of May, 2013.
by the 30th of June, 2013 so as to allow the jury time to make selections for the exhibition and the catalogue. The creators of the works selected will then be invited to send in their pieces. A pre-paid return envelope is required, works will be returned between December 2013 and January 2014). Books are available at the Palazzo Davanzati with reproductions of the rooms of the Museum for source material. The Museum is open from Tuesday to Saturday from 8:15am to 1:50pm. The Museum is also open the first, third and fifth Sunday of the month and the second and fourth Monday of the month. I think this will be a fantastic show, please let me know if you enter or go to see it!